Learning to love our Latin-Asian-Pacific future, by Gustavo Arellano. Today, California Governor Sofia Miranda-Nguyen signed a historic trade agreement with Chinese Premier Zhou Sanchez-Smith. From now on, China will favor the state with reduced prices for the soy needed to sustain California’s everlasting-tacos industry. 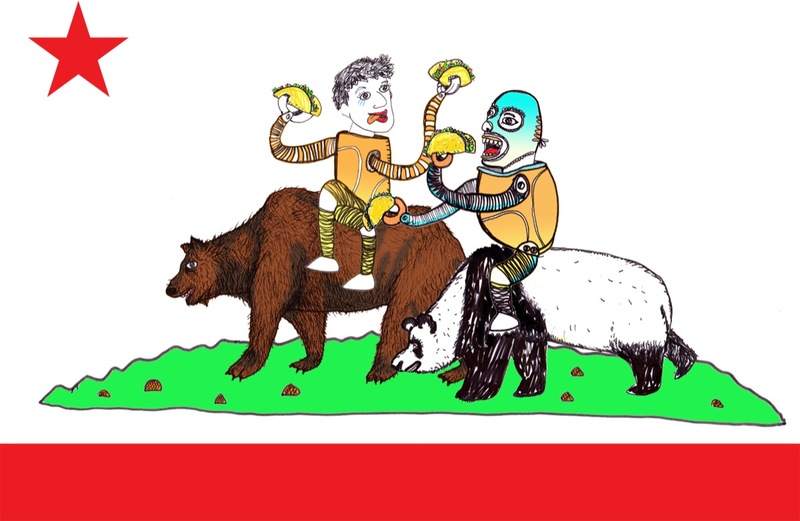 In turn, California has agreed to sell everlasting-tacos at reduced rates to China’s remaining 1 billion customers. Both Miranda-Nguyen and Sanchez-Smith reaffirmed their commitment to wipe Texas off the face of the Earth. More than a decade ago, I dated a Vietnamese American girl from Irvine. It didn’t work out because I was insufficiently leftist for her (true story: the guy she ultimately left me for called himself Lenin). But that wasn’t the best memory I have of that relationship: that would be her parents, mild-mannered refugees who were horrified that their college-educated daughter was dating a Mexican like me. It didn’t matter that I was a graduate student at UCLA at the time; for them, I was little better than a cholo with glasses. Illustration by Juan Pablo Baene. Just another episode in California’s lotería of racism, right? The relationship between California and its Asians has been notoriously fucked up throughout our history, from lynchings to internment, exclusion acts to good ol’ fear-mongering, with nearly every other group getting in on the act. But one group has always embraced Asians more than others in California: Mexicans, and in this unlikely-but-growing relationship lies California’s future, a future already present. Together, we will make California the nexus between Asia and Latin America, with the knowledge and relationships that ensure not only the future of California, but of the United States too—bigoted parents be damned. It’ll be a beautiful coda to an unlikely pairing of California’s two most loathed ethnic groups. We already have a history: various Asian groups have settled across Latin America—Chinese in Peru, Koreans in Argentina, Lebanese in Colombia, Japanese in Brazil, Indians in Trinidad and Tobago—almost from the moment Cortés and Pizarro went on their merry conquistador ways. While those groups have integrated into their respective countries, integration came after centuries of segregation, exclusion, and even mass killings—let’s not forget that the US Border Patrol was established to guard against the Chinese trying to migrate into the United States, fleeing pogroms in Mexico. But throughout twentieth-century California, any Latino resentment toward Asians or vice versa quickly disappeared as the two groups realized that they were in the same, nonwhite, discriminated-against boat. Through the decades, Asians and Mexicans joined to fight the good fight, in various battlefields in California (not to mention segregated platoons in World War II). If the following paragraph reads like a bullet-point presentation, it is: these facts need to be recited ad nauseam and entered in the official California record. In the Central Valley, Sikh men married Mexican women because the era’s xenophobic immigration laws largely prohibited Asian women from coming to this country. Filipinos famously started the grape strike that launched the United Farm Workers, and manongs, such as Phillip Vera Cruz and Larry Itliong, were influential leaders in the union for many years. In the 1940s, when the Munemitsu family of Westminster were sent off to the internment camps, it was a Mexican American farmer named Gonzalo Mendez who tended the land while they were gone; the money earned from that good deed helped Mendez and other families pursue the famous school segregation case, Mendez, et al. vs. Westminster. And this is my favorite story, only because it’s so telling: Guy Gabaldon grew up with a Japanese American family in East Los Angeles, learning how to speak Japanese in the process. His language skills helped the Marines secure the surrender of more than a thousand Japanese soldiers in the Pacific Front during World War II. Hollywood made a movie out of it…and Gabaldon was played by the very gabacho Jeffrey Hunter. Many more examples exist, of course. But my favorite example of the Asian Mexican partnership is in food. Studies have shown that Mexicans are among the world’s top consumers of dried ramen, and Chinese restaurants are a staple of barrios across the Golden State. The popular seafood dish ceviche came to Mexico via Peru via Japanese immigrants; at any Mexican supermarket, you’ll find cacahuates japoneses, Japanese peanuts, so named because a Japanese businessman introduced the soy sauce–soaked treats to Mexico City during the 1950s. One of my favorite meals growing up was teriyaki bowls, except the stands in my Anaheim neighborhood had essentially Mexicanized the dish by making the beef cuts lean like carne asada, throwing in cebollitas (grilled green onions) instead of scallions, throwing in containers of Tapatío hot sauce with every to-go order alongside the teriyaki sauce, and offering horchata to wash everything down with its sweet kick. Using food as proof for the future of California might seem trite, but food is always at the vanguard of mestizaje and shows the beautiful possibilities of cultural exchange and fusion. Consider the story of the Kogi Korean BBQ truck, already legendary despite the fact that it’s only eight years old. Chef Roy Choi literally changed America’s perception of what race could be by doing something simple: offering Mexican foods like burritos and tacos with Korean ingredients. He never claimed to have invented that mash-up. Indeed, the Kogi origin story openly admits that the team got its inspiration to open such a truck from a blogger reminiscing about his undergrad days at University of California, Irvine, in the early 2000s, and how during a Korean American frat party, the students began stuffing Korean barbecue into leftover tortillas because all of the carne asada had run out. (How telling about Asian Mexican California is it that Korean students would not only grill up carne asada alongside Korean barbecue, but finish it first?) While the world was taken by the novelty of Korean tacos, Choi just brushed it aside; to him, Asian Mexican fusion was as naturally Southern Californian as traffic on the 405. We’re a century away from 2115, of course, but simple demographics dictate Choi’s definition of his food will manifest itself. 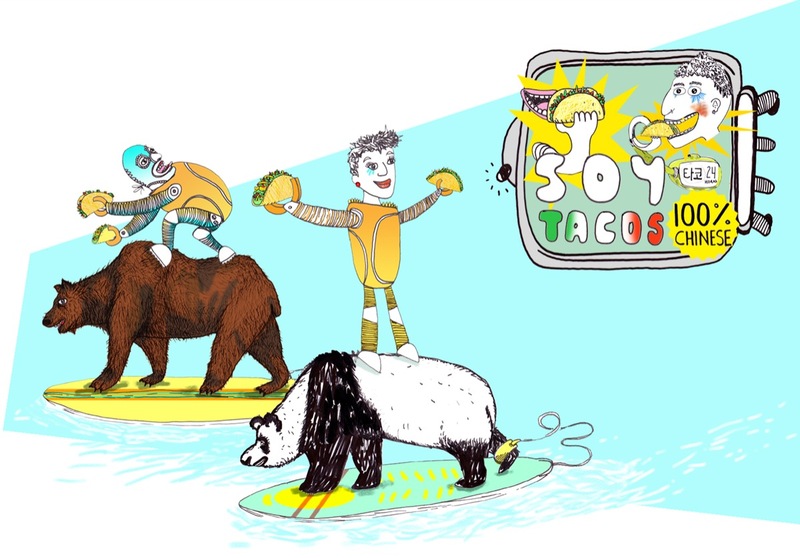 California will become a living, breathing Korean taco: Mexican in structure, Asian in essence, wholly American, and spicy as hell. The two groups will intermarry, will become neighbors—more so than now, that is. Our respective ties to our ancestral homelands will become more important as the United States seeks closer relationships with the folks we left back home—we did globalization before it became popular. Foreign investment from Latin America and Asia will increasingly turn California into a global crossroad for the world economy, which it has been for a long time already; remittances back home will help modernize countries, while residents here will influence politics there—and here too. Our mutual love of bilingualism and multiculturalism won’t be so exotic by the twenty-second century, but rather the only way for California and America to survive. It’s going to get bumpy before we get to this bright future, of course—but we’re getting there. Last year, two Latinas were convicted of manslaughter in the beating death of Kim Pham, a young Vietnamese American woman who died outside a nightclub in downtown Santa Ana. People on both sides wanted to bring race into the mix to light a fire. Longtime Latino residents complained that out-of-town Asians (mostly students from UC, Irvine) were gentrifying their neighborhoods, while Asians complained that they were making the area “safer” (read: less Mexican) by being there. A generation ago, such back-and-forth between ethnic groups in Southern California could have led to riots. What happened in the aftermath of the Pham verdict? Absolutely nothing—peace reigned, Asians returned to Santa Ana’s downtown scene, joined by Latino hipsters. While this was a huge news story in Orange County, the biggest Asian Mexican news for me last year was the marriage of my second cousin to my childhood friend, a son of Chinese parents. I hadn’t spoken to him in twenty-five years. But how the hell does a chinito marry a girl from my ancestral village?